What are the wood choices, in Lutherie? Wood Selection: Where does it come from, what kind is it, and does it matter? Treasure does grow on trees! Traditionally, violin-family instruments have been made from maple and spruce, pretty much exclusively, though there are relatively rare counterexamples–a viola made of poplar, or willow; a bass made of willow, etc. A large number of scrolls were carved of pear-wood. Usually, though, the scroll/neck, back plate, and ribs/sides are made of maple, and the belly, or front plate (soundboard) is made of spruce. The bassbar is also spruce, as is the soundpost, which is sometimes called the soul of the instrument. The fingerboard and other fittings are usually made of Ebony, which is an extremely hard, dense, jet-black, exotic hardwood. It is really only available through import. I would like to explore other options, but, for now, Ebony is the best choice. 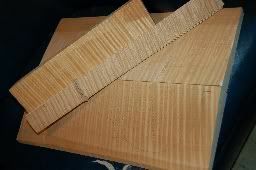 Linings and blocks are typically either spruce or willow, though there is no hard and fast rule on the wood for linings. Paul Schuback and other master makers have taught me that, while domestic maples are fine for larger, deeper-toned instruments, European maple is superior for violins. No one denies that some very nice violins have been made of American maples…they simply recognize that European maple has the edge, as far as violin tone is concerned. I cheerfully bow to their wisdom, and will probably make most violins of European maple or Red maple, from now on. Red maple, from the eastern USA, seems to most closely match European maple. 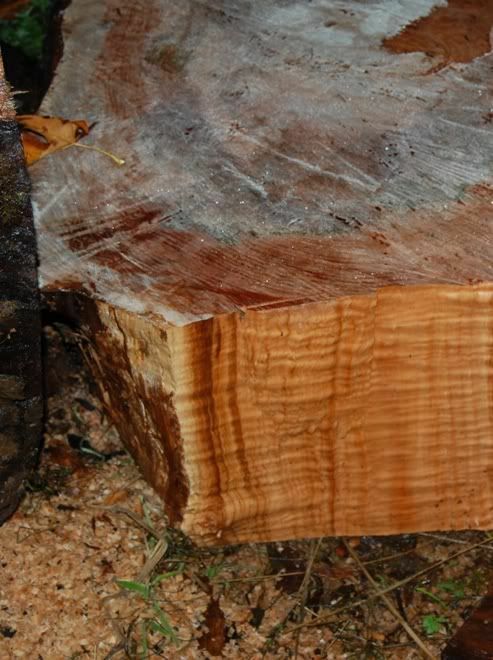 This is Michigan Red Maple from Elon Howe. Pretty stuff. 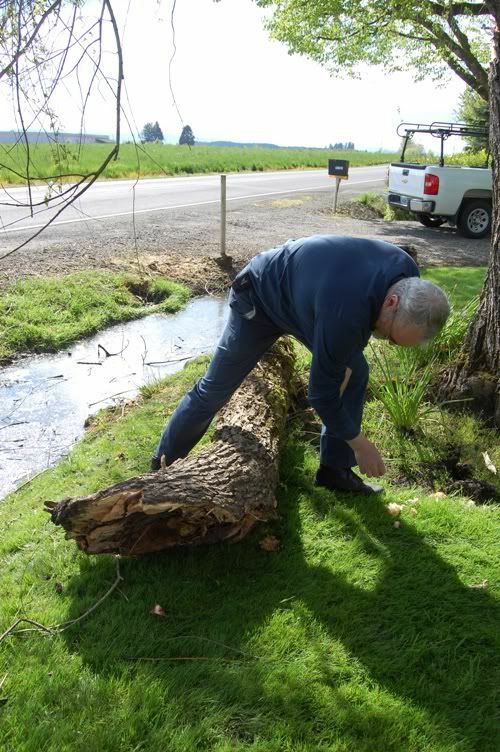 This log was given to me by Terry Howell, a local land owner and logger. He graciously dragged it out of his woods, cut it into lengths that were manageable, and loaded it onto a trailer with his front-loader. Thanks, Terry! That is an honest 17″ wide Big Leaf maple leaf. 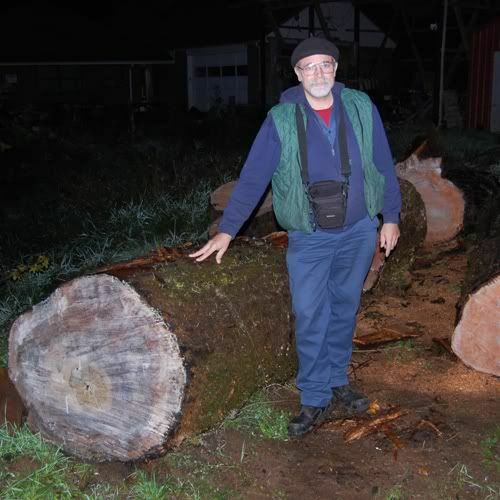 They are not all this big, but no other maple comes close. And here is where I get Willow for blocks and linings: I watch for when people lose large limbs in wind or snow storms, and ask if I can remove them. This one was full of a honey-bee nest, but it is good wood. Willow log for linings. 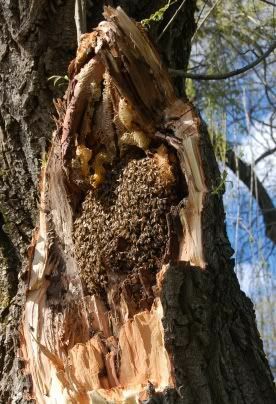 A limb fell during a windstorm..turned out to be hollow, and full of honeybees. They were gentle little folk, though, and did not offer to harm me. Here’s what’s left of the nest, still in the tree. The nest was pretty exposed after the limb fell– I hope they were able to rebuild elsewhere. Good little insects to have around. So far, I have had to purchase all the spruce I have used. There are some nice stands of Sitka and Englemann spruce here in the Northwest. I hope to go on a “Spruce Safari” someday, and bring home a prize log. 🙂 But I’m getting older, and logging isn’t easy. We’ll see. There have been makers who have (quite successfully) used other woods to build instruments. The grip of tradition is strong, however, and makers frequently have a tough time selling instruments that are NOT made of Maple and Spruce. I am willing to try other woods, but if, for example, someone wanted a fiddle out of Zebra-wood, while the idea is intriguing, I can foresee problems, and I would probably want my money up front. The instrument would doubtless be beautiful, and might even play well, but I see it as a risk I am loath to take. The labor is my most costly investment, and it is the same whether I build the instrument of traditional woods, or non-traditional. If I can’t sell it, then I have lost my time and effort, not to mention the cost of the exotic wood. As I mentioned earlier, Oded Kishony made a Cherry cello, and, while the tone actually turned out to be superior, the cello was very difficult to sell. Tradition matters, even today. Pine has sometimes been used for soundboards…even Western Red cedar has occasionally been used. But there is a reason everyone comes back to spruce– it works the best, as a rule. Plenty of counter-examples, I know, but they are in the extreme minority. There are makers who use Walnut, Western Red Cedar, Pine, Douglas Fir, Pacific Redwood, Cypress, and a host of exotic woods. No problem…but I am at an age where I can no longer afford to take unnecessary risks. I really prefer the traditional woods, anyway. However, I may do some experimentation on the five-string fiddles. Wandering outside the “orchestral sphere” sets one free to experiment a little more. That was a large log. I like the part about your using wood that otherwise might be burned or rot. Interesting that violin based instruments must be maple to sell well. For guitars, I have always had issues selling maple instruments. Dark colored wood sells better. Maybe because Gibson’s for the masses were mahogany and Martin’s were either mahogant or rosewood. I like the sound of maple but have had way too many buyers pick up and then put down a maple guitar as being too bright sounding. I think I found my answer in a maple guitar I made with a cedar top. Cedar seemed to tone down the maple brightness enough for players to enjoy the sound. I still have an archtop cedar top and a maple set so I am thinking of making my next archtop of cedar/maple. I have done cedar/cedar and cedar/walnut and cedar/cherry so cedar/maple seems a good idea. My two “in process” arch tops are the 18 inch cedar/cedar and the 17 inch spruce/cedar arch tops. Need to get these done befor starting any new build. Well…it may depend on the species of maple. There are some maples that are really too hard, and too dense for good instruments. European and Domestic are not the same, and the various domestics are not the same. 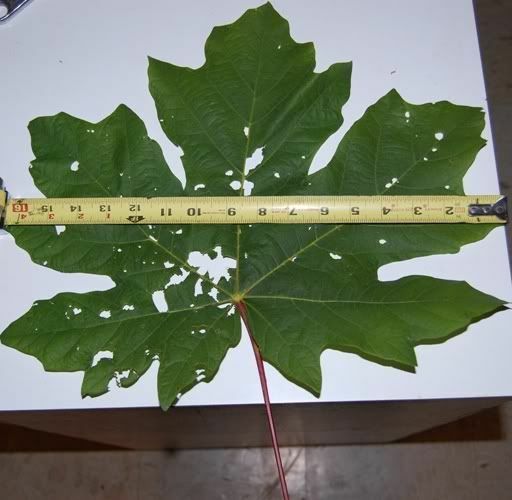 Big leaf is softer and lighter than Red Maple, which is softer and lighter than Sugar maple, (noted for its “bird’s eyes”) which most concede is not a good choice for a musical instrument, for the very reason you state. I think I remember being told that Silver maple is the softest of all…and not appropriate for violins. I wonder how it would work for a guitar…. I’d be interested to hear your opinion as to whether I might have a mountain dulcimer made with a willow sound board. Willow wood holds special meaning for me, and i am planning to have a custom dulcimer made … I have heard varying opinions on the suitability of willow for a soundboard…what do you think? Are you planning to build the dulcimer yourself? Lots of people do make them as a first instrument, as they are a little less demanding than a violin-family instrument.